The Most Reverend Deogratias Dr. Muganwa Byabazaire was born on October 9, 1941 to Laurent Muganwa of Dwoli village, Kitoba sub-county Hoima district who was then working as a sub-county chief at Karujubu, Masindi district. After his primary school education at St Aloysius primary school in Hoima town, he joined Kitabi Seminary in Bushenyi, before continuing to Katigondo Major Seminary in Masaka, where he received a bachelor’s degree in philosophy. On August 9 1969, he was ordained a priest by Bishop Albert Edward Dr. Baharagate. He first served as a curate at Munteme parish, then Bukumi as parish priest. In 1973 he served briefly as a lecturer at Katigondo major seminary, from where he was sent to Germany for further studies. In Germany he attained a Master’s and Doctorate in Theology. 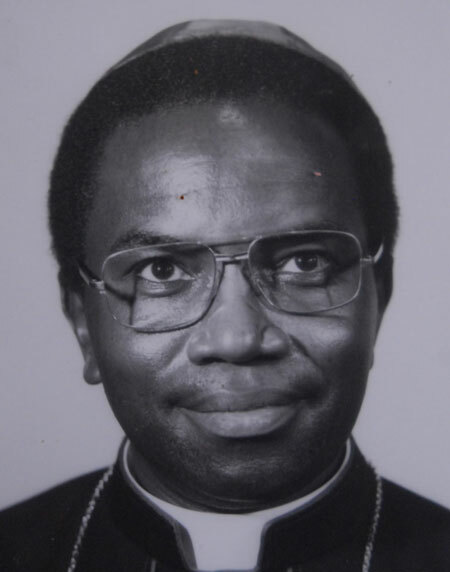 On his return, he was appointed Rector of Aloklum Major Seminary, Gulu, Uganda until he was consecrated Bishop (Coadjutor) on 18 August 1990 and installed Bishop of Hoima on 9 March 1991. In 2009, Bishop Byabazaire was diagnosed with high blood pressure, diabetes and a brain tumor and subsequently, on November 13, 2009, Pope Benedict XVI appointed the Rt. Reverend Bishop Lambert Bainomugisha, the auxiliary Bishop of Mbarara, as the Apostolic Administrator of Hoima diocese. Bishop Deogratias Muganwa Byabazaire died on Saturday, February 8th 2014, aged 71. He is buried at Bujumbura Cathedral, the seat of Hoima Catholic diocese in Hoima Municipality.